This is a delicious way to finish off a pot of beans. Usually by the end of my bean pot there are still some beans in it with quite a bit of the cooking liquid. Since I cook the beans in broth this is still a very nutrient dense liquid. We’ve talked about the wonderful benefits of broth several times and especially that it is a protein sparer enabling us to have meat less often but still maintain excellent health. Because of this, I want to use this broth/liquid to it’s full advantage. This Taco Soup is an excellent way to do that. A quick internet search will yield many Taco Soup recipes. Most of them call for powdered ranch dressing. I don’t buy that and have actually never used it so I’m not even sure what ingredients are in it to try to duplicate. No matter. We like this version just fine. I do use some of my pantry storage items for this as opposed to all fresh. But I’m sure it would be spectacular using fresh tomatoes and fresh mild peppers. I make this soup with just about any type of bean. 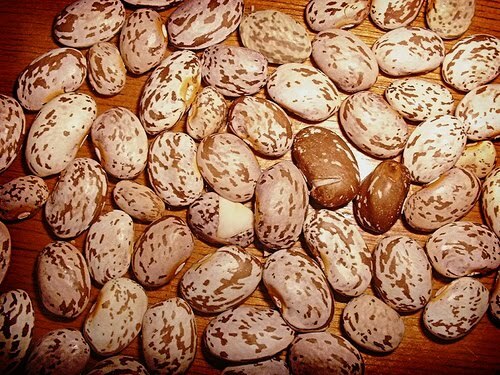 It is wonderful with pinto, black, white or red beans. You can also use chunks of meat (beef or game) instead of ground. Add more meat if you like a meatier soup. In a large soup pot, brown the ground beef along with the onions. Then add the chili powder, cumin, cayenne pepper and paprika. Allow to cook for a minute or two for flavors to coat the beef. Add the garlic and stir then add the beans and juice, tomatoes, corn and green chilies. Stir well and heat through. Add salt and pepper to taste plus additional broth/water as needed. Put any or all toppings on bowl of soup at serving time. For the tortilla chips/strips, I use leftover tortillas cut in either triangles or strips and lightly fried in coconut oil. Yum! This makes a very ample amount of soup and was enough for one dinner and one lunch for my family of five (2 adults, 2 teen girls, 1 toddler boy). This dish uses only 1/2 pound of ground meat (you could certainly add more or even omit if desired, remember the broth is nutrient dense), I like to use the other half pound of beef as a pizza topping the next night or I’ll brown it and freeze for future use. Photo Credit: Basswulf on FlickrLearn more about my other two eBooks, Design a Dish and Thrifty Food Plan Experience by clicking here.